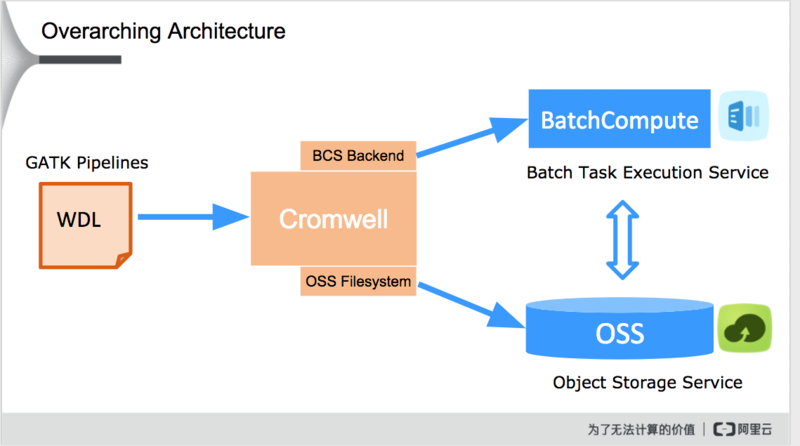 Alibaba Cloud, the largest cloud provider in China, has developed open-source command-line utilities that leverage Cromwell to enable execution of analysis pipelines on the Alibaba Cloud platform, as shown below. Alibaba Cloud provides pre-configured environments and pipeline templates to make it easy to setup your pipeline, modify your input files, and submit/monitor jobs (via BatchCompute CLI or a console). For more information, check out the Getting Started with Alibaba Guide and the full Alibaba Integration Guide in the Cromwell documentation.